The shopping is done, the food is all bought and many of us are finishing up the pumpkin pies, bread rolls and breaking the bread for the stuffing for tomorrow’s big dinner. We can’t help but be thankful for all we receive, the friends we have and the family that live so close by; close enough to share dinner with us on this festive holiday. After the dishes are washed and the platters all put away we will be reviewing those Black Friday Advertisements looking for that very special deal. It has been tradition in our family being passed down from generation to generation to begin Black Friday with an early morning trip out to breakfast to have that much needed cup of java and tea to get our day going, you see if you’re like us it the early bird that gets the worm. I’ve just learned that Kohl’s is opening at 4 AM and I’m already making my shopping list! The husbands all think we’re nuts but we know the real meaning of a good deal and it comes in stores on Black Friday! While most are just starting their holiday shopping on Black Friday, many are finishing up this very same day. I tend to be one of those people finishing up but love the crowds that Black Friday brings out. Usually I am down to needing just a couple gifts for those harder to buy for people on my list. I always know that I can rely on their favorite gifts; Christmas gift baskets! With all the good tasting treats and sweets included inside our gifts they are always a welcomed gift and good tasting too! At BisketBaskets.com we have Christmas gift baskets for families, corporations, clients, dogs, cats and pet lovers; something for everyone! Come visit us online and shop our lowest prices in years. You can shop early and have your gift shipped closer to Christmas; our ground shipping fee for the lower 48 is only $9.99 and we ship to Canada too! Celebrate the holidays with a great gift basket! Tomorrow, families around the nation will gather together to celebrate the spirit of giving thanks, but after those leftovers are put away and the pumpkin pie finished off, it’s time to start thinking about giving in a different way. It’s time to start thinking about what you’re going to give your friends and loved ones for the holidays. Some people will head to the mall on Friday and fight the crowds. Others will prefer to shop from the comfort of their own homes. However, if you really want to take advantage of some great online shopping deals, the best time to do it isn’t on Friday or over the weekend. The time to save is Cyber Monday – and it’ll be here before you know it! But don’t just worry about taking advantage of Cyber Monday deals at BisketBaskets.com. We have great prices all year round, incredibly low shipping rates, and a full selection of holiday gift baskets that are ready to meet your needs for anyone on your list. Just be sure that you shop soon! The closer we get to the holidays, the fewer baskets there will be for you to choose from! Take advantage of the great savings and huge selection at BisketBaskets.com and start completing your holiday shopping list today! If you have a dog and live anywhere near Marysville, WA, you must take your loyal pooch over to Adventure Dog Ranch! Adventure Dog Ranch is technically a kennel for when you need to board your dog, but it’s so much more – it’s a cage-free alternative, dog daycare, and dog training facility. Your dog will be able to have fun playing in a total of 21,200 square feet, supervised by the professionals at Adventure Dog Ranch! Adventure Dog Ranch is a member of the American Boarding Kennel Association, and prides themselves in strictly abiding by the Quality Canine Care Agreement. Their goal is to treat each and every dog like the dog is on vacation, providing it with fun and great care, leaving you with the peace of mind to also enjoy your vacation! We hope you’ll browse around their site and check out their Board & Train Packages! Their new idea for an alternative to dog kennel cages is such an inspiring idea, and goes a long way to ensuring our pets have exceptional lives! Give Thanks to Your Host…and His Dog! Thanksgiving is almost here and people just like you are scrambling to find the perfect host or hostess gift to present to the family once you arrive just in time for turkey. In most cases, a dessert, a nice bottle of wine, or a lovely gift basket would do, but don’t forget, you have to be gifting every member of that host family, not just the two-legged sort. Your host’s dog also deserves his own Thanksgiving feast on the big day and it may be best for you to serve something up that he’ll love – and we’re not talking about a little bit of turkey off your dinner plate. Dogs and hosts can both appreciate any of the Thanksgiving Dog Gift Baskets from BisketBaskets.com as they’re the perfect way to treat the pup to something special on the holiday. Filled to the brim with gourmet treats and snacks that are made just for dogs, these gifts are the perfect way to say “thanks!” to your host and his pet. Plus, some of these gift baskets can double as a gift for both your host and his dog, like the Treats for Two Gift Basket or the Thanksgiving Together Gift Bag. Both of these Thanksgiving gifts are filled with yummy treats – for both dogs and people – so that your host family gets something special on that special day. Order now before it’s too late and make sure that you give thanks to your host…and his dog! We had the pleasure of recently meeting Lisa from Gone to the Dogs, a dog blog with tons of personality and spirit! The blog is a great read for any dog owner out there, covering daily dog activities and even dock diving events! The blog specifically talks about Autism dog services and the various ways dogs work and train to become a service dog. We hope you’ll check out Gone to the Dogs – the author of the blog is one lovely lady we’re glad we said hello to, and the posts are full of heart and inspiration! We can all feel the excitement growing as Halloween is over and the pumpkins have faded away into cooking pots everywhere. Making homemade pumpkin pies is tradition in our household because they are so easy to make for Thanksgiving dinner. Thanksgiving just wouldn’t be complete so if you still have a pumpkin or two hanging around here is an awesome Homemade Fresh Pumpkin Pie recipe that is easy to make and bake from scratch! Thanksgiving at our home is always filled with friends, family and a lot of laughter. Getting the whole family together begins the time of sharing of stories and of times past. We seem to always start out by reflecting on those carefree days and times of stress and struggle. Before too long, the conversation inevitably changes to “remember when we did…” (I know right now your chuckling)! It is amazing how many times as siblings we share experiences at Thanksgiving that our parents just never knew about and many times it comes with the gasp and the sigh of “Ohhhhhh” as the final piece of the puzzle falls into place after many years of wondering! At the end of the day our bellies are full, our laughter is hardy, our smiles are radiant and our friends are plentiful. Each year our invited guests always seem to bring a gift to thank us for our hospitality. Be it a bottle of fine wine to enjoy with dinner or a basket of fresh fruit or even a festive gift basket. BisketBaskets.com can help you with your hospitality gifts as well. 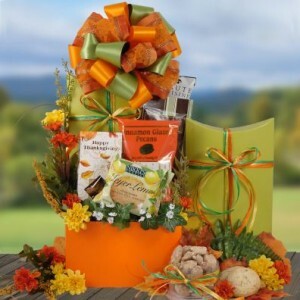 We offer great gift baskets filled with delicious sweets and treats and even an adorable cookie bouquet with pumpkin, oak leaves and Indian corn shaped cookies suitable for a table centerpiece. Let us know how we can help you make this Thanksgiving special. With Thanksgiving being a time to be thankful for all that we have it is only fitting that we say thank you to you our customers and to wish you all very safe travel as you go to and from your family and friends homes this holiday season. Thanksgiving Food Traditions Around the U.S.
Thanksgiving will be here before you know it and families just like yours will be gathering around their tables to celebrate. This year, as you plan your menu, remember that your family traditions aren’t the only ones being celebrated on that special day. In fact, the foods on your table may be totally different than those on your neighbor’s table or a family member’s across the country. Let’s take a closer look at favorite Thanksgiving foods and how they’re different around the nation. Most of the time, this Thanksgiving headliner is served up roasted, grilled, deep fried, or smoked, but sometimes, that’s not the only thing on the menu. Some families even opt for roast beef, ham, crab or lobster, or even a tofu turkey or stuffed pumpkin in lieu of this poultry favorite. Depending on the area you live in, you’ll find stuffing recipes that are infused with local flavor and favorite ingredients. Traditional turkey stuffing is usually kept simple with sage, thyme, celery, and onions, however, other families around the nation will use sausage, bacon, apples, pancetta, dried fruit, nuts, pumpkin, or even oysters! Mashed potatoes, corn, butternut squash, macaroni and cheese, candied yams or sweet potatoes, green bean casserole, carrots, salad, rolls, and broccoli can be found on tons of tables this season, however, down south, you may find that black eye peas, okra, greens, dumplings, and hominy are on the menu! Depending on the region you live in, you’ll probably find pies filled with delicious local ingredients like New England cranberries, Southern pecans, apples, sweet potatoes, pears or other yummy fruits and nuts. Remember, when it comes to dessert, the sky is the limit!